Step inside the brain of Rock and Roll Hall of Famer Bernie Worrell for groovin' keyboard tips. 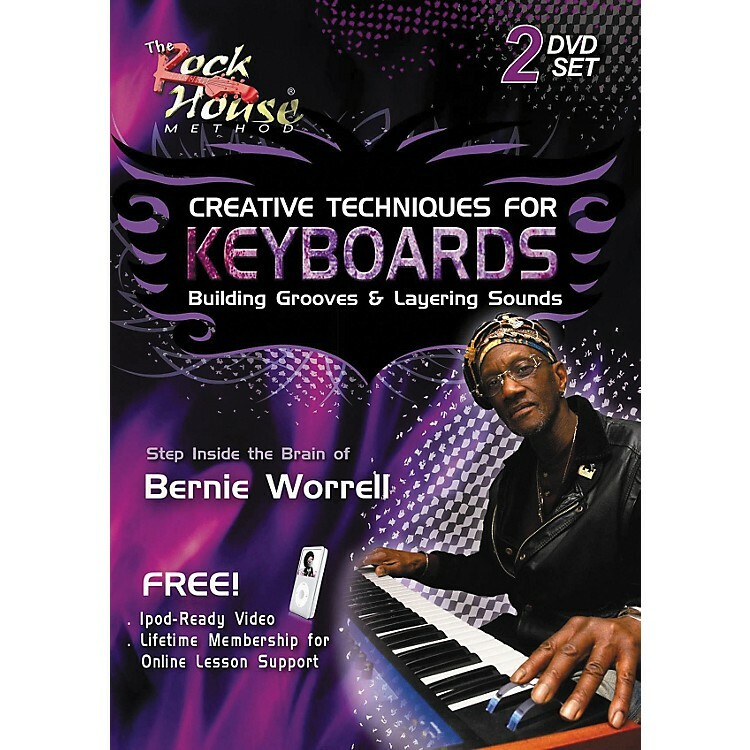 The Rock House Creative Techniques for Keyboard - Building Grooves & Layering Sounds double instructional DVD set brings you lessons from legendary keyboardist Bernie Worrell. A member of the Rock and Roll Hall of Fame, Worrell is a musical genius who has performed on over 300 records with artists such as Parliament, The Pretenders, Buddy Guy, Buckethead, Les Claypool, Gov't Mule, Albert King, Keith Richards, Dee-Lite, Jack Bruce, Talking Heads, and many others. On Creative Techniques for Keyboard Bernie demonstrates how he uses clavinet, organ, piano and strings to enhance his music. Bernie teaches you his groundbreaking techniques-like bassline doubling, repetitive themes with variations, syncopated upbeat stabs, octave jumps and staccato. He shows you how to build grooves, layer sounds and apply them over progressions. See how Bernie adds color with effects like wah, phaser, flanger, fuzz and much more. Creative Techniques for Keyboard - Building Grooves & Layering Sounds includes iPod-ready video and free lifetime membership in Rock House's online lesson support. Enhance your learning experience to links with instructors, download backing tracks, access message boards, and much more. You'll connect with a community of musicians around the world learning to play music using The Rock House Method. Spend a weekend with Bernie and liven up your keyboard skills. Order today.